Cinderella (2015) is a jump to life of the old fairy tale by Charles Perrault. The romantic fantasy story is retold this time in a different way. It is not a remake of the 1950 Walt Disney musical film of the same title. It was directed by Kenneth Branagh and produced by Disney Pictures. The movie was a commercial success when released in March this year, making more than $ 538 million worldwide, 5 times higher than its budget sum of $ 95 million. It has a total runtime of 105 minutes, quite short and simple. 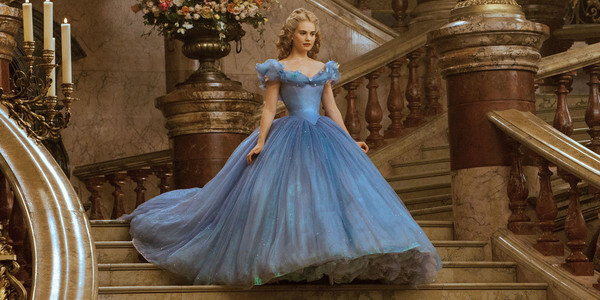 It featured stars like; Lily James, who played young lady (Ella) “Cinderella”; Cate Blanchett, who played the wicked step mother (Lady Tremaine); Richard Madden, who played the charming prince and Helena Bonham Carter, the fairy Godmother. Other stars featured include Stellan Skarsgård, Holliday Grainger and Derek Jacobi. The story is about a beautiful young lady (Ella) who loses both parents at an early age and is maltreated by her stepmother. She had a perfect life until her mother passed away after an illness. She was taught by her to be kind to all, even to animals and to be courageous. Her father remarried a widow who had two daughters, Drisella and Anastasia. Her father travelled abroad on business one day and the woman revealed her true character. She was cruel towards the young girl and made her sleep in the arctic. Ella’s father died abroad and this made her situation worse. They mocked and treated her cruelly all the time. Their bad treatment forced her to leave the house one day for the woods, where she met one of a group of young men hunting a stag. The young man who happened to be the prince of the kingdom was mesmerised by Ella’s kindness, demeanour and views about life. The two parted without knowing their identities. When it was time for the prince to marry, he decided to organise a ball at which he will choose from among the ladies who will attend, a wife. All the maidens in the kingdom were invited. Ella, totally transformed by the powers of her godmother also attended. She wins the first dance with the prince and the two get attracted to each other. They moved into the garden of the palace to talk. 12 struck and Ella had to hurriedly run from the place, leaving one of her shoes behind. The prince kept it. After the death of the king, the prince decided to choose for himself a queen. He searched for the charming lady whose shoe he still possessed till he found Ella. The two married and lived happily ever after. Ella forgave her family for their cruelty towards her. Costumes used for the movie had to be carefully made to reflect the plot. Characters were adorned to set the movie in the 1940s and 50s. A good digital editing was done to produce the desired effects of each scene. The movie has excellent special effects and good visual quality. It is accompanied by good music based on romance which perfectly reflects each moment and scene. Many critics admired the movie after watching it, asserting it is a genuine upgrade of the old fairy tale. The director deserves commendation for a good work. Reviewers have praised the movie for its deeper psychological depth and the fact that there are no open ends in the plot, leaving no questions unanswered. This is quite unlike most fairy tale movies. The movie has good themes and symbolisms. “Cinderella” is a masterpiece. Cindrella was was childhood role model and I used to say that when I will grow up, I will become like her. After watching this movie with my daughter, it made me remember those olden days. Thank you.